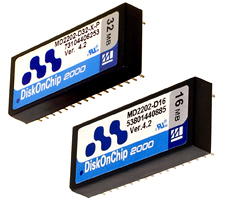 DiskOnChip 2000 - IN STOCK !! The M-Systems DiskOnChip 2000 family of products are high-performance, single-chip flash disks available in a wide range of capacities - adding MegaBytes of file storage space for embedded systems. These unique data-storage solutions offer fast, low cost solutions for applications in need of additional Flash memory space. Their patented TrueFFS technology is built-in to provide full read/write disk emulation. Many JK microsystems x86 single board computers are equipped with onboard 32 Pin DIP sockets available for the installation of a DiskOnChip product. For added convenience, several sizes are stocked and available for purchase with your product order.